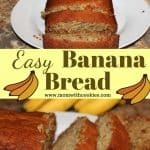 Easy Banana Bread Recipe is the best in flavor, super soft and moist! A great way to use up overripe bananas, this bread is simple and healthy. 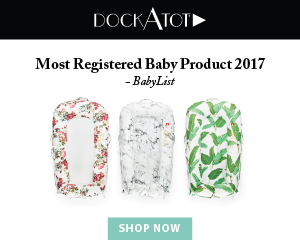 In an effort to fully disclose, this recipe contains affiliate links for products I use. If you purchase something, I would receive a commission. For more information, see my disclosure page. What is the best banana to use for banana bread? 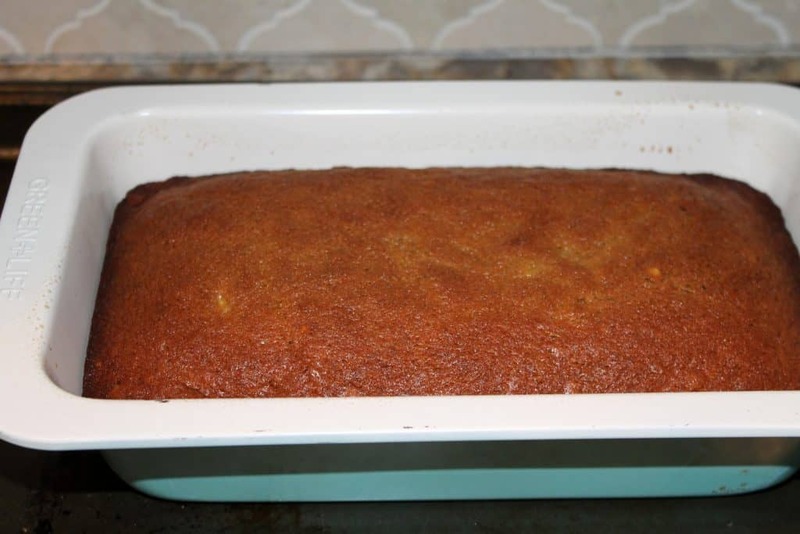 To make the best banana bread recipe, you will want to use overripe bananas that are starting to turn brown. When bananas turn brown, they get sweeter. This means you need less added sugar, and makes for a healthy banana bread. My particular recipe involves using 4 bananas, but you want to find small to medium bananas. If you are using large bananas, only 3 should be sufficient. What are the best additions to banana bread? Will this easy banana bread recipe work for muffins? Another question you might have will be if this recipe will work for muffins, and the anser is yes! My recommendation would be to use either cupcake liners, or spray some pam on the muffin tin. Scoop the banana bread batter 1/2 full, and then bake for 30-40 minutes. You will want a toothpick to come out clean! 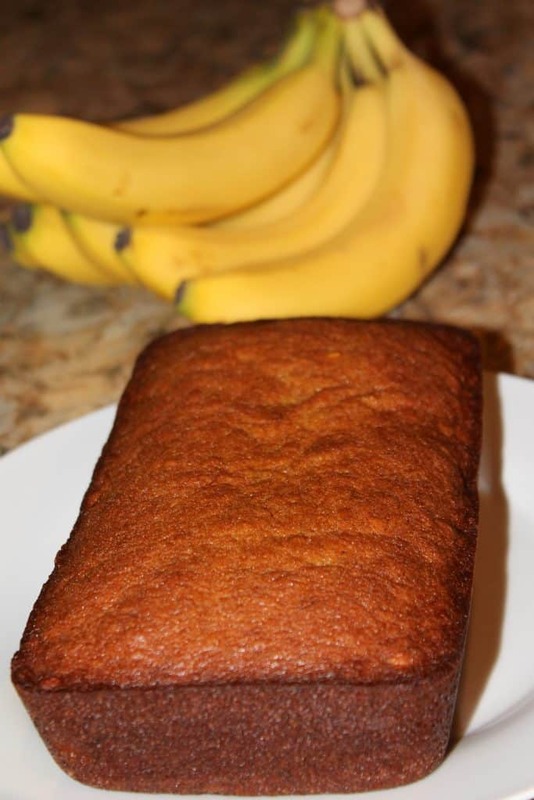 What are the ingredients you will need to make this banana bread? First thing you will do before making this banana bread recipe is to pre-heat the oven to 350 degrees Fahrenheit. 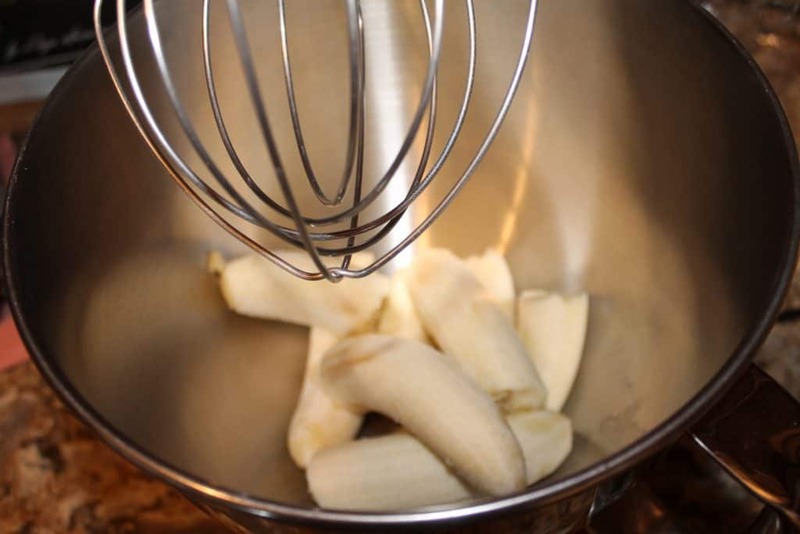 Then, add the bananas to your mixing bowl and with the whisk attachment, mix for about 2 minutes. This helps get those bananas mashed up! The next thing you will do is add in the melted butter or almost melted. Then, mix these for about 1 minute. 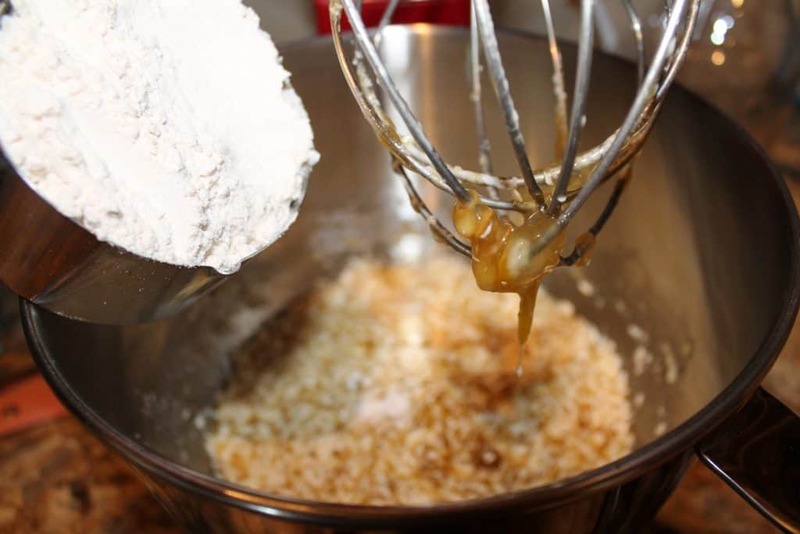 Then, you will add both the brown sugar and the granulated sugar to the mixing bowl. 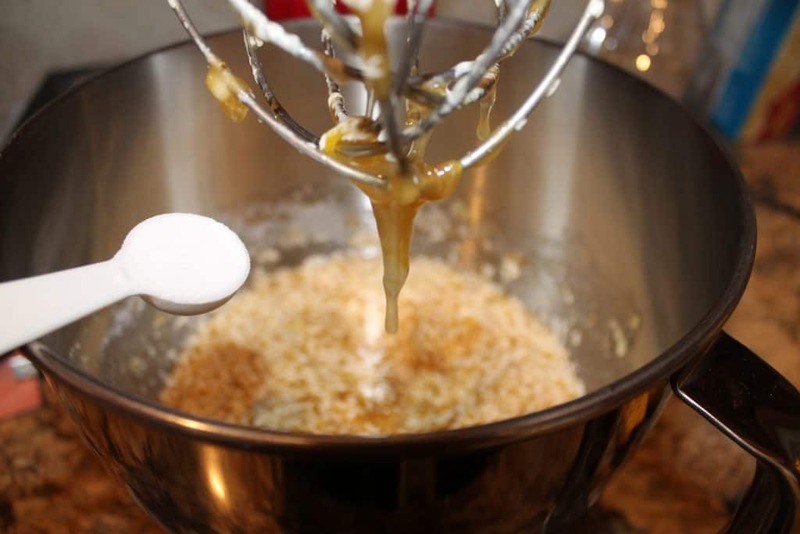 Mix for another minute to ensure that the sugar is evenly distributed. The next step will be to add in your two eggs. Mix for at least 2 minutes. Then, add in your vanilla extract and baking soda. I add the baking soda in before the flour so that it has a chance to really get mixed in thoroughly! Finally, add in the flour! Mix for another two or three minutes, scraping the sides of the bowl with a rubber spatula. This helps loosen up any stubborn flour that might not have gotten mixed in. 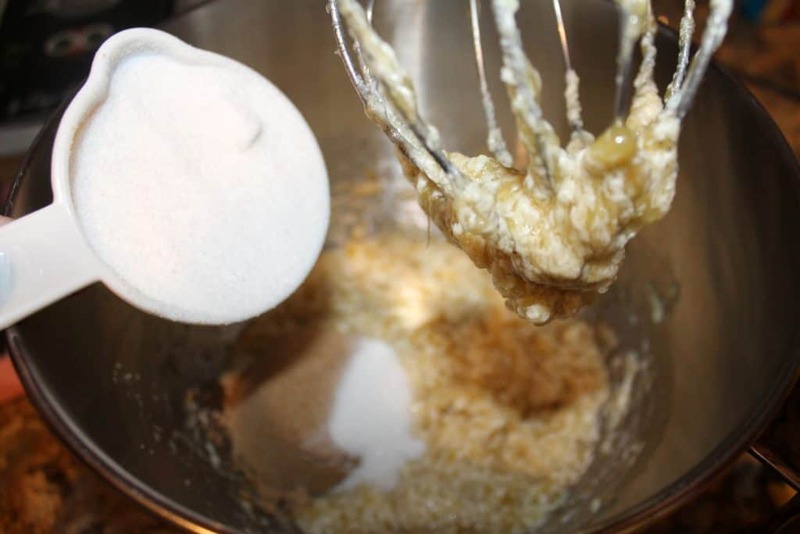 Pour this banana bread batter into a greased loaf pan. I used the ceramic coated loaf pan that can be found here on Amazon. 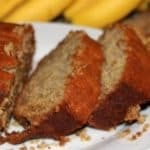 Bake this banana bread at 350 degrees Fahrenheit for 50-60 minutes or until the center comes out clean with a toothpick. Thanks for stopping by and checking out this easy banana bread recipe! f you enjoyed it, please remember to share it on Pinterest or your other favorite social media platform. Thanks!! 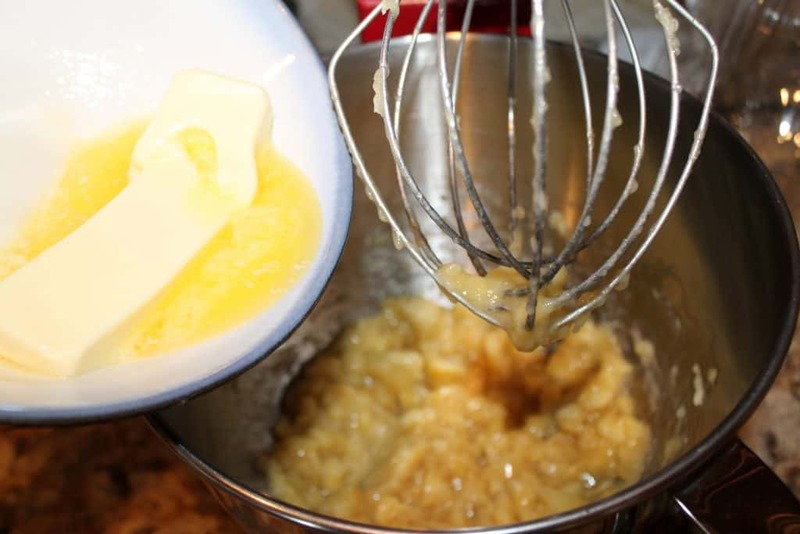 Then, add in the melted butter to the mashed bananas. Mix for about 1 minute. Then add in both sugars. You will then mix for about 2 minutes until the sugar has been mixed well. The next thing you will do is add in the eggs. Mix well, and then add in your vanilla extract and baking soda. Finally, add in the flour. 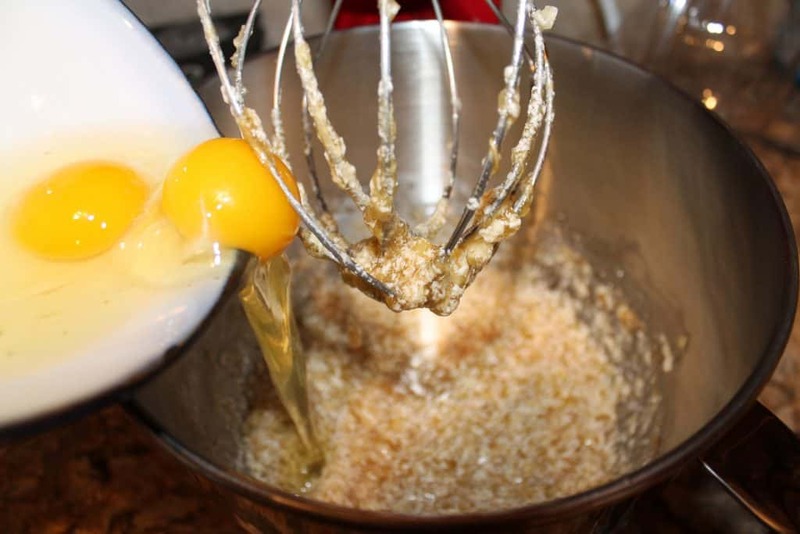 Mix well, and use a rubber spatula so that you get any ingredients that may be sticking to the sides of the bowl or the bottom. 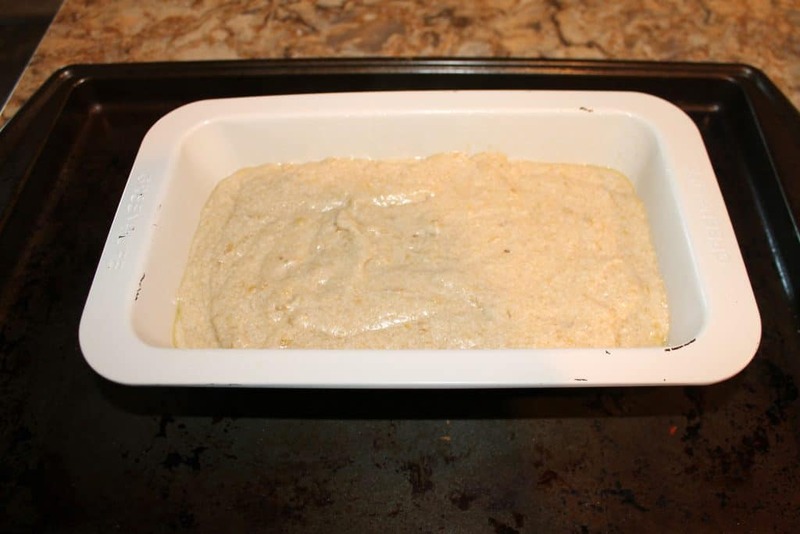 Pour this banana bread batter into a greased loaf pan and bake for 50-60 minutes. You should be able to stick a toothpick in the center and it comes out clean. Let it cool for 5 minutes and then serve! Any leftovers should be wrapped up with plastic wrap or placed in an airtight container.